In a series of interviews with Bill Moyers in the late 1980s, then-retired scholar of comparative mythology Joseph Campbell pointed to the New York City skyline: “You can tell what’s informing a society by what the tallest building is.” In medieval towns, that was the church. Beginning in the eighteenth century, the tallest structures were the political institutions, the palaces. In Campbell’s time and place—late twentieth-century Manhattan—the highest points in a city were the “centers of economic life,” the top floors of office buildings. 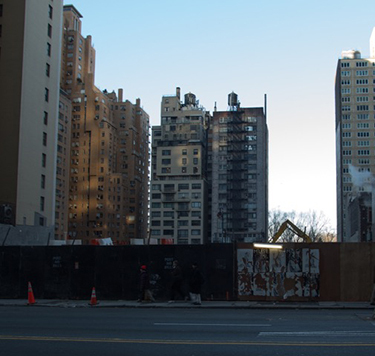 For many city-dwellers, the trend in development of luxury condos underscores the extreme inequality that has long characterized New York City’s economic landscape. “It was not that long ago that Columbus Circle was the makeshift residence of dozens of homeless people squatting at the site of the abandoned New York Coliseum,” wrote Times journalists Louise Story and Stephanie Saul. 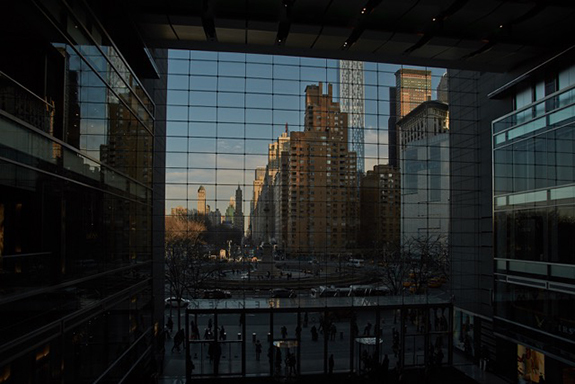 These days, the former site of the Coliseum houses the mall at the base of the Time Warner Center, the first super high-rise tower to have been built along the southern edge of Central Park. Developments like the Time Warner and, more recently, One57, Nordstrom Tower, and 432 Park are not merely symbolic of a system that unequally distributes its wealth in favor of the very rich: they contribute to the foundation of that system, providing tax breaks and subsidies to developers, driving rents ever higher, and marginalizing people whose mere presence is believed to do harm to property values. In the years following the housing and financial crises that left many without jobs or homes, “the contrast between the House of Have and the House of Want” has grown all the more discernable. Walking through the streets of midtown, day or night, from Chelsea to Columbus Circle, one views the real-life circumstances of the city’s poorest residents against a backdrop of wealth. Recent data published by the Coalition for the Homeless reveals the painful irony underscoring this scene: the primary cause of homelessness is a lack of affordable housing. The number of New York City’s homeless residents has risen 21% since 2010 to over 60,000; more than 14,000 families depend on the city’s struggling shelter system; and at last count nearly 5,000 men and women were sleeping rough in the parks and streets. Above it all, palatial residences with views of Central Park sell for millions of dollars a piece and many a pieds-a-terre sit empty. In 1879, political economist and reformer Henry George published his social treatise Progress and Poverty exploring answers to the question of why, as economies progress and technologies improve, the wealth gap grows and the circumstances of poverty worsen. George believed that the poor and middle class could benefit significantly, could in fact be lifted up from poverty, if land and other natural resources—what modern-day Georgists call “the commons”—were taxed and the profits distributed equally among the rightful owners, the public. His proposal has meaningful implications in today’s urban centers where, as Filler observed, “smokestack-like protuberances … signify the steadily widening worldwide gap between the unimaginably rich and the unconscionably poor.” In fact, Manhattan’s skyline might be read like a bar graph measuring this gap: as towers reach higher and housing costs steepen, the middle-class recedes and the poor are pushed further into the shadows. In the dealings of urban real estate development, a claim that situates one community necessarily displaces (and disempowers) another. In Brooklyn and Queens for instance, renters and long-time owners alike suffer the consequences of speculative real estate practices set in motion by a rapid rise in property values. Less palatial but nevertheless expensive units are sold and rented to people who have been priced out of Manhattan, and low-income and middle-class tenants struggle to stay in their homes. These days, even the furthest reaches of the outer boroughs see their share of shiny new buildings whose effects on long-standing communities are often damaging. In 1971, New York State authorized the 421-a program with the aim of spurring affordable housing development in low-income neighborhoods and promoting diversity in the form of mixed-income communities. More recently, critics of 421-a have cast it as a failing initiative providing the greatest benefits to investors, who, in addition to gaining zoning rights, receive significant tax breaks with a provision that they build an agreed-upon number of affordable units on or off site. Indeed, despite these agreements, companies too often do not follow through with the housing they promise to build, or do not provide the quantity of units proportionate to their development activity. In other cases, they offer that housing under circumstances some believe to be discriminatory. It is, in fact, a building. A building in which people live. A building whose construction employs people, and whose existence expands the New York City tax base. Even better, it’s a building that created subsidized dwellings in a desirable location for 55 lucky families. But Yglesias’ conclusions rely on a belief in the notion of a trickle-down effect that, like the metaphor he opposes, is largely symbolic. The profits earned by Extell for those fifty-five apartments, and the tax breaks awarded in exchange for their inclusion, far exceed the benefits that we are assured will distribute in the forms of jobs or affordable housing. By the April 2015 deadline for applications, more than 90,000 families had applied for those fifty-five spots. Distributed in this way—obtained at such odds—affordable housing appears comparable to the winning stakes in a state-sponsored lottery. “Lucky families” indeed. An outsized sense of entitlement is implicit in these imposing structures that make claims on public space, as well as on natural and economic resources. And yet Yglesias and others have balked at the suggestion that a building that normalizes discriminatory housing practices might stand as a symbol of inequality. “[A] building doesn’t create, foster, or even emphasize inequality,” wrote Chris Pomorski in the New York Observer, “it can, however, act as a mirror, the revelations of which are occasionally uncomfortable.” But Pomorski too deploys a powerful metaphor, that of a mirror image. Perhaps unknowingly, he has underscored a prominent and equally discomfiting feature of “Billionaire’s Row”—its large, reflective walls. 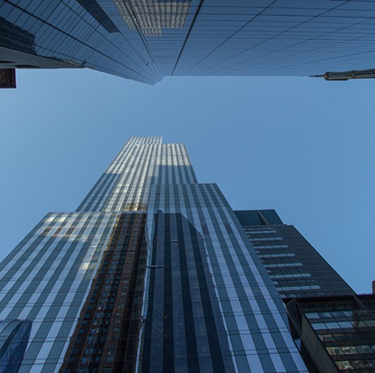 Completed in 2014, One57 has lately supplanted the Time Warner as the symbol of public concern for private developments’ encroachment on public space. At certain times of day, depending on where in the park you stand, the flat face of the tower mirrors the sky and almost blends in. In the photo opening this piece, sunlight cast on the western face of One57, and the reflection of passing clouds, lends it a camouflage—smoke and mirrors. But a photo taken on the same day from the east side of the park shows the effect is no longer one of concealment. The tower is backlit and dark, its shadow stretching across walkways and meadows. Gone is the camouflage of what might be compared to a chameleon resting against a rock. What appears in its place is the gnomon of a gargantuan sundial. James Wrona’s photographs might be read as an attempt to access a view of “Billionaire’s Row” that is both complete and unique—a challenge, James reports, given the size of these structures and the range of attention they’ve already garnered. These buildings are not just exclusive; they are elusive. Inside the Shops at Columbus Circle, patrons of J. Crew and Whole Foods can only wonder at how the city’s wealthiest residents enter the condos just above, as their entrances are intentionally hidden from view. Looking out through the all-glass front that makes up the mall’s main entrance, James depicts the lobby as a sort of gallery: a gallery of shops, but also a gallery of windows looking out onto a collection of wealth. [T]he park is to be surrounded by an artificial wall, twice as high as the Great Wall of China, composed of urban buildings. Wherever this should appear across the meadow-view, the imagination would be checked abruptly, at short range. Natural objects were thus required to be interposed, which while excluding the buildings as much as possible from view, would…establish a horizon line, composed, as much as possible, of verdure. Around the same time that Olmsted was finalizing his plans for a central park, George was devising a proposal to foster the notion of a public commons. While George’s ideas were not universally embraced, they continue to hold significant potential in today’s cities, where resources by which corporations yield incredible profit range from water and air rights, sunlight used for solar energy, and even the naturally occurring electromagnetic frequencies used by Internet service providers. “People claim the land by creating sacred sites,” the mythologist Campbell explained—and in doing so, they transform natural and cultural landscapes, often irrevocably. For many New York City residents, the most sacred places are perhaps the public grounds, the rare bits of land reserved for parks and green space. But as the values of a society change, so do conceptions of spaces deemed sacred. Today the park’s “artificial wall” is not twice but thirty times the height of the Great Wall of China—and growing. These buildings do not merely check the imagination, they loom large with a presence that will not be short-lived. 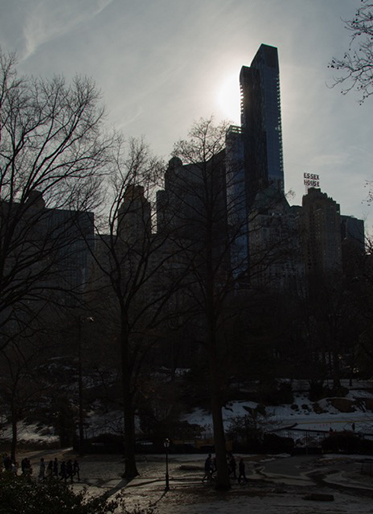 It would be generous to assume that the design of One57, meant to resemble a cascading waterfall, took to heart Olmsted’s plans to insinuate nature. The waterfall spills, as it were, away from the park, to the south. The north-facing surfaces of One57 and its neighboring super-towers are flat, more like walls. This observation echoes one put forth by Washington architect Shalom Baranes, who describes development in terms of beautification. The towers are, he explained, like the walls of a great, “outdoor room.” Indeed, like a vast parlor, the ornate walls of which signify wealth that for all but a very few is—and will always be—unattainable. James Wrona is a portrait, travel, and landscape photographer based in New York City. He has collaborated with Elizabeth Murphy on two previous photo essays for this magazine: “Perpetual Meadowlands: Among the Reedbeds of the Hackensack,” which appeared in our summer2012 issue, and “'As Having Life': Reflections on the Gem of the Mall,” which appaeared in our summer2013 issue. His website is jameswrona.com. Henry George, Progress and Poverty: An Inquiry into the Cause of Industrial Depressions and of Increase of Want with Increase of Wealth: The Remedy (1879). Martin Filler, “Conspicuous Construction,” New York Review of Books, April 2, 2015. Joseph Campbell, The Power of Myth, (New York: Doubleday, 1988), 95-96. Louise Story and Stephanie Saul, “Stream of Foreign Wealth Flows to Elite New York Real Estate,” New York Times, February 7, 2015. Henry George, Progress and Poverty. “Basic Facts About Homelessness: New York City,” Coalition for the Homeless, accessed May 7, 2015. Charles V. Bagli, “In Program to Spur Affordable Housing, $100 Million Penthouse Gets 95% Tax Cut,” New York Times, Feburary 1, 2015. Laura Kusisto, “A ‘Poor Door’ on a Planned New York Apartment Tower with Affordable Housing Gets a Makeover,” Wall Street Journal, August 28, 2014. Matt Yglesias, “In Defense of the NYC Poor Door,” Vox, July 31, 2014, quoted in Chris Pomorski, “The Worst Thing About the ‘Poor Door’ Might Be Its Nay-Sayers,” New York Observer, August 27, 2014. Mireya Navarro, “88,000 Applicants and Counting for 55 Units in ‘Poor Door’ Building,” New York Times, April 21, 2015. Emily Badger, “In the Shadow of Booming Cities, a Tension between Sunlight and Prosperity,” Washington Post, Wonkblog (blog), May 4, 2015. W. H. Auden, “City Without Walls,” City Without Walls: And Other Poems (New York: Random House, 1969), 3. Frederick Law Olmsted, “Defending His Park Against Philistines,” Lapham’s Quarterly. Frederick Law Olmsted, “Plans for Central Park,” Empire City: New York Through the Centuries, ed. Kenneth T. Jackson (New York: Columbia University Press, 2002), 9. “Introduction,” Empire City: New York Through the Centuries, ed. Kenneth T. Jackson, (New York: Columbia University Press, 2002), 279. Joseph Campbell, The Power of Myth, 95-96. Though Central Park is, ostensibly, a public space, a private group known as the Central Park Conservancy has, since the fiscal crisis of the 1970s, shared in its upkeep and management alongside the City of New York. 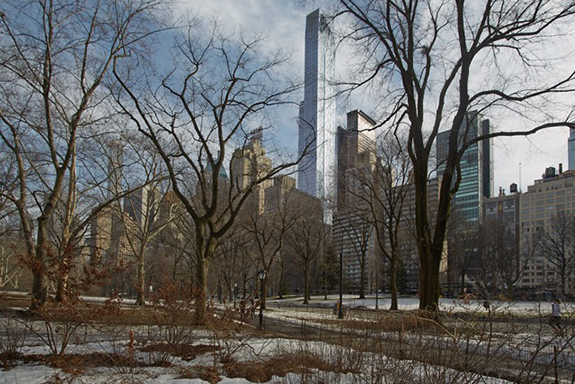 Serving on its board are developers and other investors in the real estate surrounding Central Park.